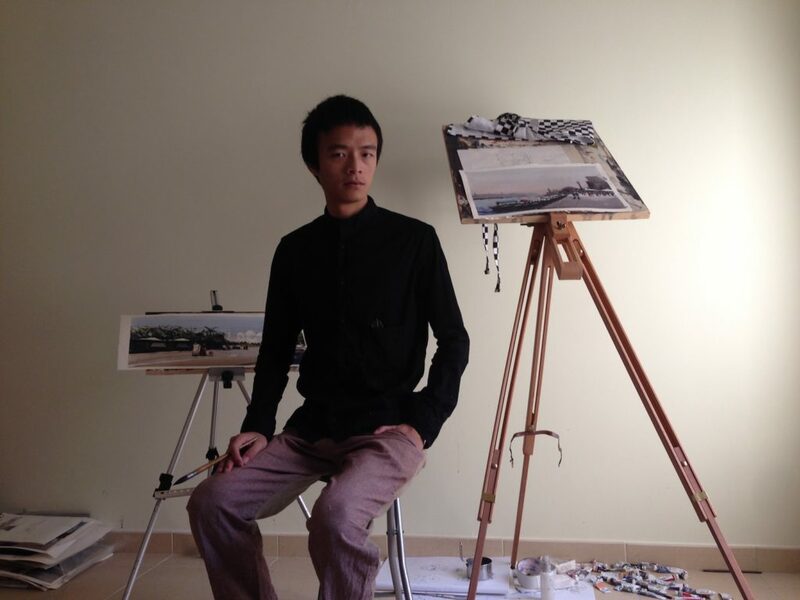 I was so happy when Laober Zhu agreed to be interviewed for my artist interview series here on the gallery. Last May I found his piece, Light in the Dark, and immediately featured it. Now that I had the chance to interview him I took the opportunity to ask him about the piece. I think you’ll enjoy the background story and the name and feel of the painting will make a lot of sense. Let’s hop right into the interview. How did you get started with art and, in particular, watercolor? My father and grandfather both are artists, I began to paint when I was 3 years old. Maybe art chose me. As to watercolor, I did spent a long time to find a medium which is close to nature, effected by my father who is a traditional Chinese painter and several contemporary watercolor masters, I chose watercolor as my main medium. I think watercolor can let me combine the spirit of Chinese art with the technics of western art. Watercolor painting is effected by time, temperature, and many other factors, so it’s full of surprise, it makes watercolor so fantastic. How may your tools have changed from the beginning? I tried many tools, different brands, different material. After lots of trying, I chose brushes made of sable pure cotton rough paper, and I got a palette which is custom-made by House of Hoffman, that’s the best one I have ever tried. They are all my favorite now. I stumbled across your work and last May I featured “Light in the Dark” (pictured below) … Can you tell us the story behind creating this piece? I just wanted to challenge myself to paint night scene, since dark scene is hard to paint in watercolor. I created a suspense story about witcher. One night, when the witcher went back home holding a lantern, he found the lights in his house was on, but he lives alone, he didn’t know what happened. I created this painting and tried to express the suspense atmosphere. Which artists have been the most influential to you and have you stumbled across anyone new lately that you’d like to share? John Singer Sagent, Zorn Anders, Andrew Loomis, Guan Weixin, Josepth zbukvic. I would like to share Alexander Votsmush. His watercolor painting has strong personal style, like fairy tale. Aside from watercolor what other hobbies do you have? My thanks again to Laober, and every artist so far in the interview series, for taking the time to answer these questions. I’m looking forward to publishing many more. You can find Laober at his web site, on Twitter, on Facebook, and on Tumblr.